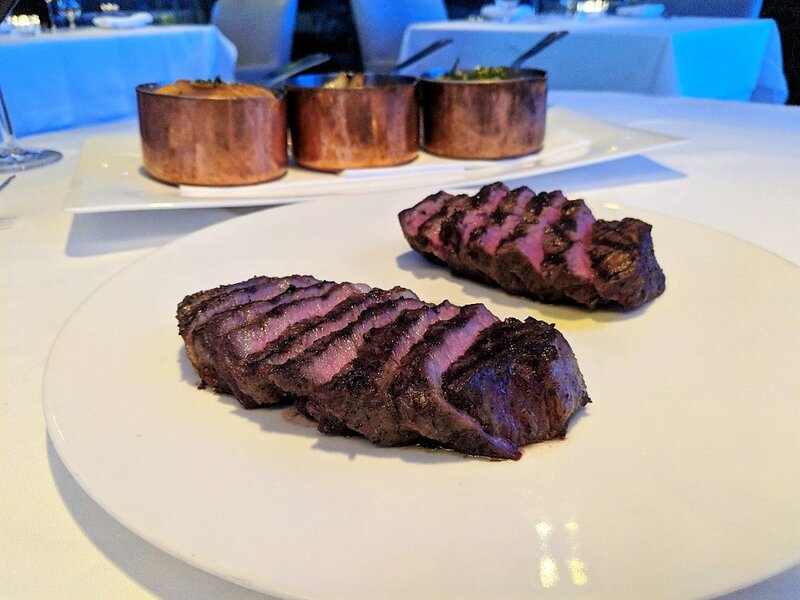 I made my first visit to Michael’s on Simcoe last week, a 5 year old steakhouse in the heart of Toronto. I was treated to a tasting menu that showed off a little bit of everything from their kitchen and also wines to pair with each course. When I first walked in, there was a modern vibe as the entire restaurant was dimly lit with blue lighting. They had a wall of wine that was prominently displayed at the front of the restaurant and next to the dining area, diners could take a peek into a meat locker, filled with huge chunks of dry aged meat. I tried one of their signature Raspberry Mojito cocktails to start, which uses muddled raspberries and fresh mint. A small plate of house made potato bread with dips was brought to the table, a nice twist on the usual steakhouse dinner rolls. Our official first dish of the night was a Branzino Sea Bass Ceviche. A brightly colored ceviche dish made with lime shallot marinade, cucumber basil chili salad and olive oil. I loved how the fresh citrusy flavours mixed with the meaty chunks of fish. The next course was a duo, with a fried artichoke heart plated next to dry aged carpaccio. The carpaccio was made with a thin slice of aged prime rib striploin wrapped around arugula and topped with shaved parmesan, preserved truffle and lemon truffle dressing. The super soft cured truffle added even more richness to an already richly flavoured beef- very decadent. 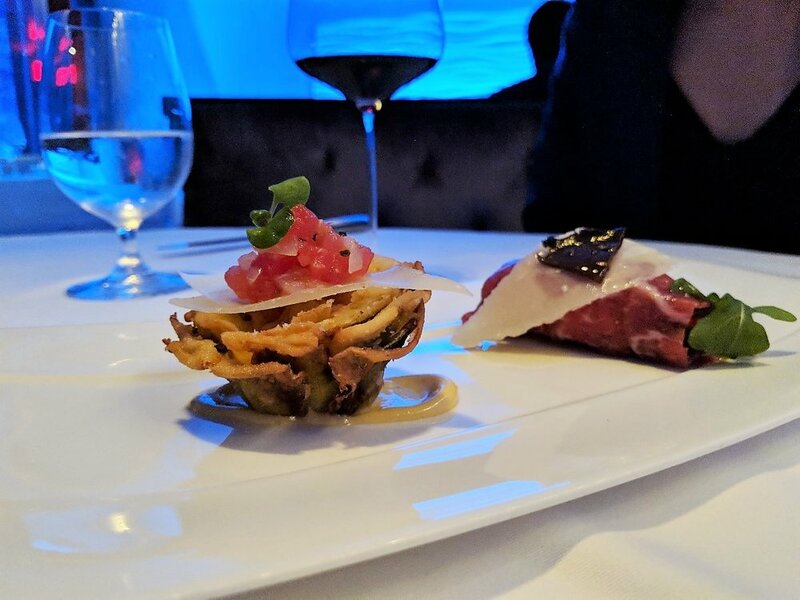 With the crispy fried artichoke heart, it was very interesting that they were able to bring out a rich savoury taste in a vegetable to match the decadent beef carpaccio. Next up was two house made pasta dishes served in little copper pots. One was a mixed mushroom and ricotta filled Carmella pasta served with porcini mushrooms, olive oil, more ricotta and fresh basil. The other was a Squash Angolloti- roasted squash and ricotta filled pasta with brown butter sauce, veal jus, parmesan, fried sage, olive oil and fresh black truffle. Both were excellent and although I don’t usually order pasta at steakhouses, this may change my mind. We also had a taste of some of their seafood offerings with a beautifully plated Seared Scallop. Each plate had a big Nova Scotia scallop, seared on both sides, sitting on top of brown butter infused polenta, roasted squash caponata and garnished with sage leaf. Each bite of the scallop was rich and juicy. I was very excited when steak was brought to the table. We were served a steak tasting of USDA Striploin and a Certified Island Beef Tenderloin from PEI. We didn’t get to pick how the steak was cooked, but both came perfectly medium rare and were sliced into strips to share. Three sides came with the steak including brussel sprout slaw, garlic mashed potatoes and sauteed mushrooms. It is quite a steak experience as the servers plate the steak and sides right in front of you. 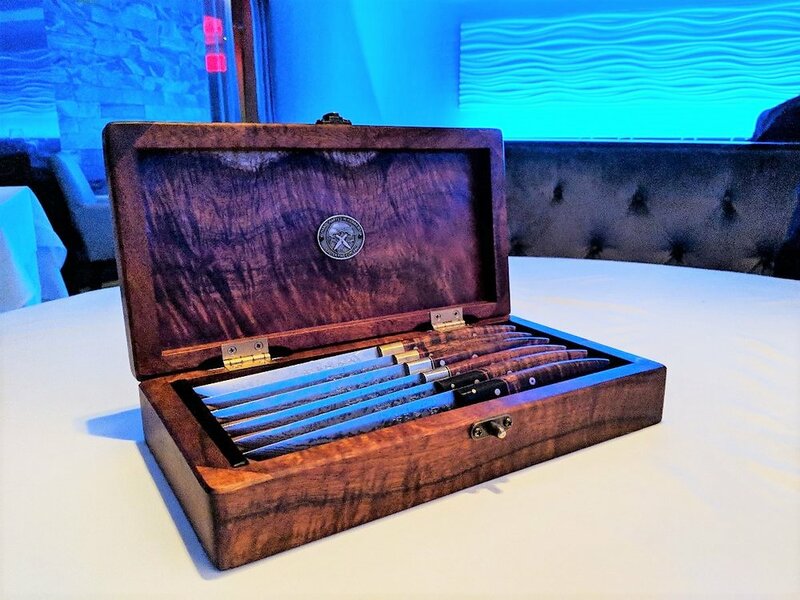 Each diner selects a steak knife from a wooden box of beautiful hand crafted knives from Salter Fine Cutlery. A process that definitely adds to the experience. Our meal was complete with a mouthwatering dessert platter with a chocolate mousse tart, creme brulee, biscotti and house made ice cream. The service at Michael’s was impeccable from start to finish. It is a high end steak house and their menu tends to be on the pricier side depending on the cuts of steak you order. They have an extensive selection of steaks including 5-Star Wagyu and Kobe cuts if you really want to treat yourself. Special thanks to the maître d Alex who walked us through all the food and wine pairings. Michael’s on Simcoe specializes in steak, but they also have a diverse menu of well executed pasta and seafood offerings to choose from.